Faculty co-authors included Drs. Edgar Diaz-Cruz, Kelley Kiningham, Montgomery Williams Kenneth Reed and Kristy Wahaib. 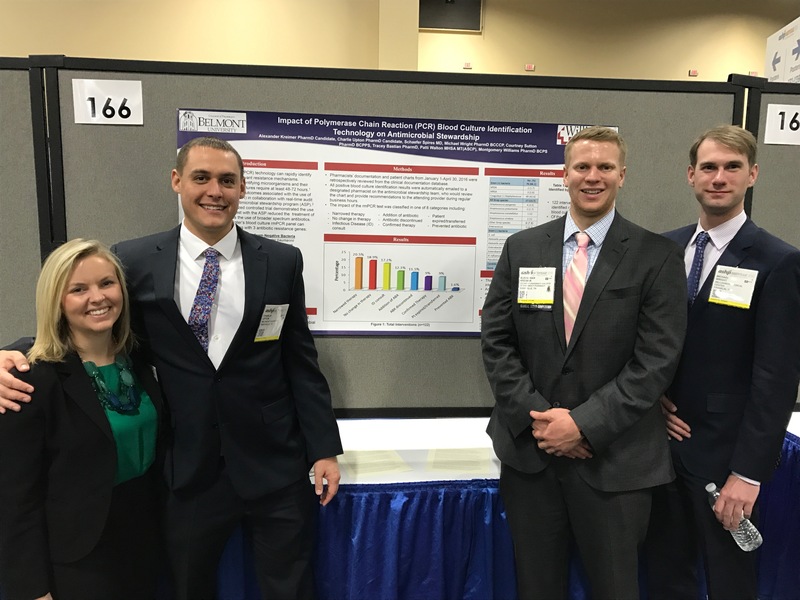 Student pharmacists Alex Kreimer and Charlotte Wesley represented BUCOP in the international clinical skills competition final rounds, and Belmont Assistant Professor of Pharmacy Pratice Dr. Montgomery Williams presented an invited platform presentation titled Antimicrobial Stewardship: Innovative Practices in Community Hospitals. Belmont student pharmacists and faculty welcomed alumni at a reception in conjunction with the meeting. Many of these alumni are completing post graduate year one and post graduate year two residencies throughout the country. ASHP’s Midyear Clinical Meeting and Exhibition is the largest gathering of pharmacists in the world. With its focus on improving patient care and medication safety, the meeting is attended by more than 20,000 pharmacy professionals from around the globe. For more than 50 years, the Midyear Clinical Meeting has provided pharmacy practitioners with a value-packed event for advancing knowledge, networking with colleagues, enhancing practice skills and learning about the latest products and innovations.